The Stanley Lewis Collection of gentlemen's accessories is a compilation of the finest and most exclusive men's fashion accessories in the world. 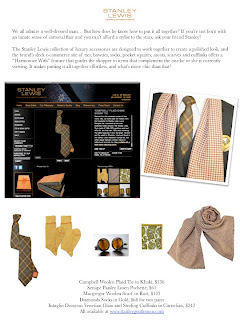 Uniquely designed, all product is Made in Italy by the world's most respected craftsmen and includes a superlative range of men's designer neckties and colorful designer socks. The colorful, dapper, Italian handmade silk neckties and coordinating socks sit alongside exclusive handmade 925 silver cufflinks, luxurious silk and linen scarves and hand rolled pochettes. The idea for sophisticated pairings of ties and socks evolved after brand co-founder Anne Harding spent countless hours in airport lounges observing men at work: Harding noticed that the executives working on sleek laptops and cell phones in transit lounges tended to wear their designer suits, fancy ties, limited edition watches, and expensive Italian leather shoes with dull, pilled, sometimes even mismatched socks. 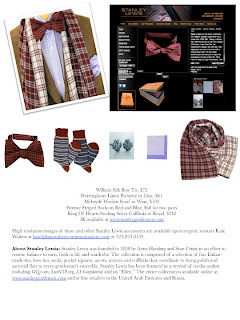 Believing that men worldwide shared a need for balance in life and wardrobe, and recognizing an opportunity to address a gap in the men's fashion accessory market, Australian-based Harding and her partner Stan Crinis pooled their extensive experience in fashion and retail to found the luxury brand with a global perspective in 2008. Harding and Crinis sourced manufacturers from throughout Italy for their handmade wool-lined silk ties and complex, colorful and comfortable socks. They added Italian-made 925 Silver cufflinks and silk and linen pochettes and scarves to the range to round out the offerings.